A look back: What blogging looked like 10 years ago. How long have you been blogging? Whenever I answer this question about 70% of the people are a little shocked when I say I started in 2004. Most bloggers seem to be closer to the one to two year range. Way back in 2004 the internet was a different place. At home, I still had a dial up internet connection and an AOL account. I miss the sound of a modem connecting…so comforting! I didn’t text. I just talked to people on the phone. Yes, that’s how weird life was back then. I started blogging because deep down I am a writer and blogging was the only way I could get my writing out of my head. Social media didn’t exist, unless you counted MySpace, which we didn’t. Facebook wasn’t around, for the masses anyway, and those who created Twitter were still working for Blogger. That’s where I started…on the Blogger platform. It was fairly easy to use and free. Images on blogs were beyond my pay grade, as it was for most people. My cell phone didn’t have a camera (heck I didn’t even text on it), so I would have had to carry a digital camera with me everywhere I went. Bloggers didn’t do that back then. Unless they were photographers or possibly food bloggers, but I don’t remember many food bloggers prior to 2006. Creating an image was something only graphic designers did. Now you can go on sites like PicMonkey and make them for free with little to no knowledge of design. Granted, they might look like that to a trained eye, but a bad image is better than no image in the SEO world. SEO was also a fairly new thing for bloggers. I never wrote to have my posts found by Google. I didn’t care about things like that. I just needed to write. I was young and dumb, what can I say? Niche blogging was just non-existent. Being a blogger was a niche. Sure, there were some people whose blogs focused on tech, but most bloggers, at that time, had some sort of knowledge of basic HTML at the very least. Being paid to be a blogger was like finding a unicorn. It didn’t happen. Big corporations didn’t know what a weblog was while newspapers and magazines were still trying to figure out their way through this whole internet thing in the first place. Mommies didn’t blog. They raised kids and worked. I’m sure there were a few mommy bloggers, but no one called them that. They were just bloggers. Technology has made it much easier for your blog to be fancy, but one thing has never changed…good writing is what keeps people coming back for more. You could have the prettiest looking photos and design, but if I see that you never use capitals at the beginning of your sentences or god forbid you center justify all of your text and you’re not a poet, I’ll never come back to your site again. I can’t wait to see what the next ten years hold. Who knows what new technologies will come out and influence our lives? My 10 year anniversary was in May, so I know exactly what you’re talking about. I met some really great bloggers back in the day & got so much great music from them. It’s a very different world out there for bloggers now. And I gotta say, your line about center justify and not being a poet made me laugh. I’m glad! That center justification thing annoys me because I’m pretty sure the people doing it are just trying to be fancy. It’s not easy to read. Good idea! My writing style has definitely changed too over the past decade. I’ve grown as a person and as a writer. If you count my livejournal, which is still online and which I still update a few times a year, I’ve been blogging since 2004 as well! I started in the spring of my junior year of high school. It’s amazing how much blogging has changed since then! It must be interesting to go back through those old posts and see how much you’ve also grown. I can’t wait to see what’s in store for the next 50 years! I jokingly refer to myself as an “Internet Encino Woman” because I’ve been blogging in some form or another since 1995. I get strange looks when I say that I remember how the world wide web was before ebay, Amazon, Twitter, mom blogs, and Google. WOOT! Congrats on 10 years! Thank you! It doesn’t seem that long. Blogging is fun! I have not covered even half of your journey and that is what makes this article even more interesting for me. Not much has changed in the last 4 years but the transitions of the decade are amusing. Thanks to all you veteran bloggers, who did not let the concept of blogging die out, we still have a chance to be ‘writers’. I am not a poet but I do start my sentences with capitals 🙂 Hope to have you over! Hopping over from Wake-Up Wednesdays. I am a co-host at the party and would like to thank you for joining us! Dropping in from SITS Sharefest! 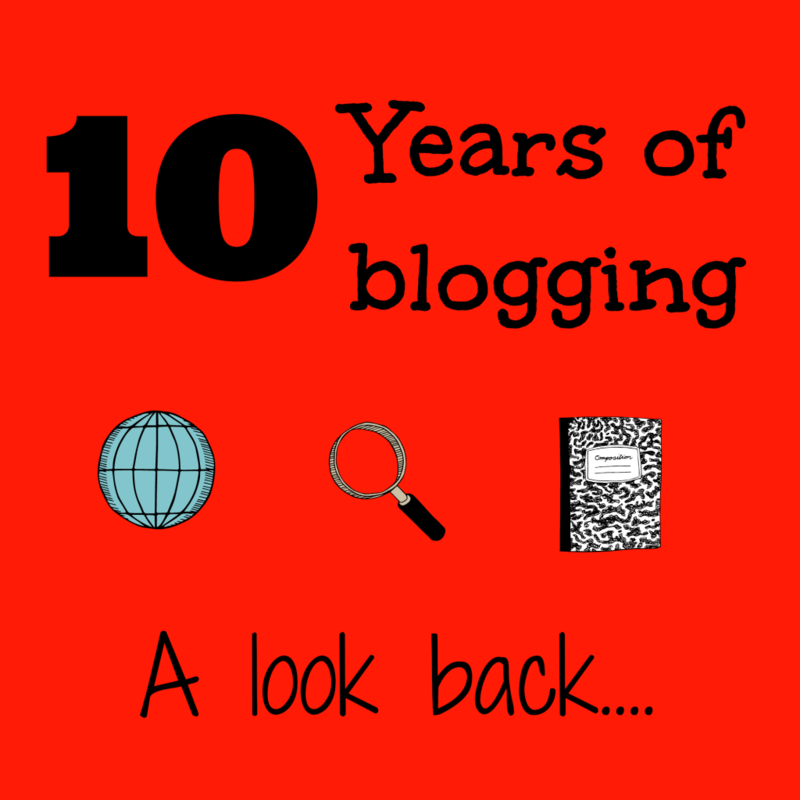 I admit I am one of the shocked when I hear people say they’ve been blogging for 10 years. That. Is. Amazing! I can only imagine the differences in doing things then. The chances of finding a blog on a mobile device was slim to none. And people were probably even wondering what the heck a company like Google was going to do.